You are probably aware by now that I have a special offer on at the moment enabling you to have loads of ribbon to play with in all sorts of different colours and styles - at a fraction of the cost of buying full reels (click here for more information). This week I'm showing you projects I've made with some of the ribbons in the pack and, today, I'm showing you a ribbon technique that works with circle punches of the same diameter as the width of your ribbon. The first card uses the 1/8" handheld circle punch with the 1/8" taffeta ribbon for example. Now because this ribbon is quite narrow, some of you may overlook it; but you can do so many things with this kind of ribbon that you can't do with wider styles and, in my opinion, its stitched white border makes it a show-stopper. In my special pack you get three colours - Early Espresso, Marina Mist and Rich Razzleberry - and I've chosen to use the sumptuous Razzleberry today. It's easy to create this pretty effect with this type of ribbon and it adds something special to the stamped image without overwhelming it. I'm very excited to be using new stamps today! This is a level one hostess set called Silhouette sentiments and I love it! I like to create gardens with my floral stamp sets and it's great fun with these delicate plants. More Mustard and Rich Razzleberry made a nice rich colour mix and I have found that Bravo Burgundy is just right as a base for Rich Razzleberry. Cut a piece of Very Vanilla card stock 8cm wide x 11.5cm high. Scallop the bottom with the scallop border punch. Turn the card stock over and draw a straight line across it about 2.5cm up from the scallop. Mark 1/2cm increments along the line. Using this as a guide punch some holes using the 1/8" handheld punch. Stamp the three plants from Silhouette Sentiments onto separate corners of the imaging sheet (use any ink you have to hand.) Now colour in the stamps and stamp a row of the flowers using the stamp-a-majig for accurate placement. Use the stamp-a-majig to stamp the sentiment. Thread 1/8" taffeta ribbon through the holes and tie a neat bow at the side. Mount the panel onto a piece of More Mustard card stock cut 8.5cm x 10.5cm. Mount this onto a Burgundy card base - mine was an obscure size because I didn't need an envelope with this card, but it will work well with an A5 card base. I also wanted to show you a bolder version of this card, using the 1/4" grosgrain ribbon and the 1/4" circle punch. Here I've used Real Red ribbon against the delicious Tangerine Tango. I adore ALL the papers from the Greenhouse Gala collection (as you may know by now...!) and would HIGHLY recommend this pack to anyone who'd like a selection of papers to make bags and boxes with as well as using for cards and scrapbooking. And have you spotted my new sentiment stamp set? It's called Thank you Kindly and, since I send so many thank you cards, I thought it was about time I had this set! Already, I can see it's going to be a firm favourite. Well, that's all for today folks. For anyone interested, I have absolutely no idea what my cat was trying to say yesterday. She just led me round the house for a bit, meowing. I suspect she might have been complaining bitterly about the inferior brand of cat food she is forced to eat and suggesting that tins of tuna or freshly roasted chicken would be the way forward. Eventually I bored her into submission (I'm an expert at this as my children will testify!) and she retired to her little bed, muttering occasionally. Are you ready for more ribbon ideas? I shall be back tomorrow with a superfast card for Three Minute Thursday. Hope to see you then. These are just stunning Vicky, I love the first one, the whole effect of the stamping and the ribbon techique just gives it the real wow factor...plus I love the colours you have used. Aren't cats funny creatures...we have two (sisters) but Maisy can't miaow and never has been able to so she just kind of squawks at you which is really quite funny...and she also takes to licking plastic bags if she is hungry in the hope that it will annoy you that much you will give in ! 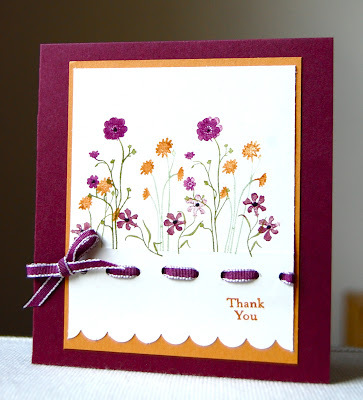 Vicky, your Stem Silhouettes card is just gorgeous! The flowers look so beautiful done like that, and I love your colour combination! I really like the purple and gold color combo of the first card and use of the bold patterned paper on the second. And such a creative use of the ribbon on both. I have some cats who will eat anything put in front of them and others who prefer only certain flavors of canned cat food. When I serve a flavor they don't care for, they will nudge against me asking where the good stuff is. Stunning cards Vicki, the first one is my favourite. Love the threaded ribbon technique you showed here, Vicky -- and I especially like the colors on the second card. The way you cut around one of the flowers to make it go outside the box (so to speak) was genious. And who would've thought that Tangerine Tango and Real Red would look so great together?! I love the Thank You Kindly set, too. Worth every penny, I'd say -- great fonts and works well for both girly and masculine cards. I love the idea with the ribbon.